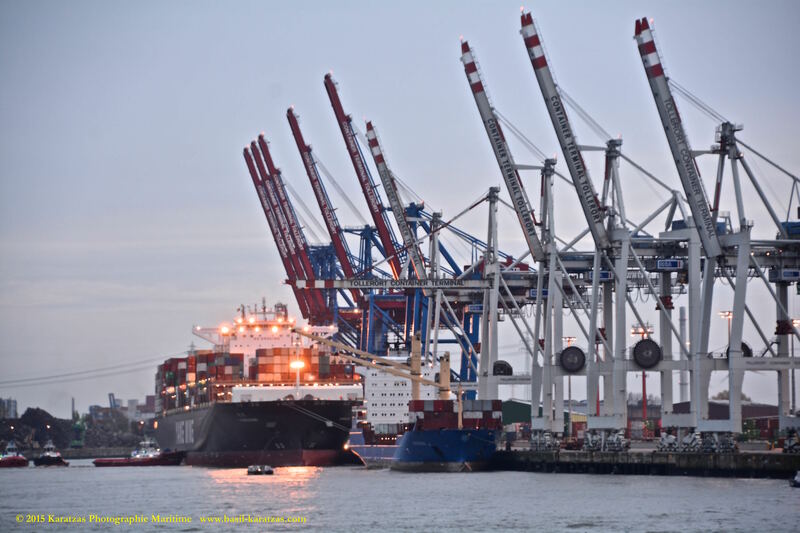 Posted on January 9, 2016 by Karatzas Marine Advisors & Co. 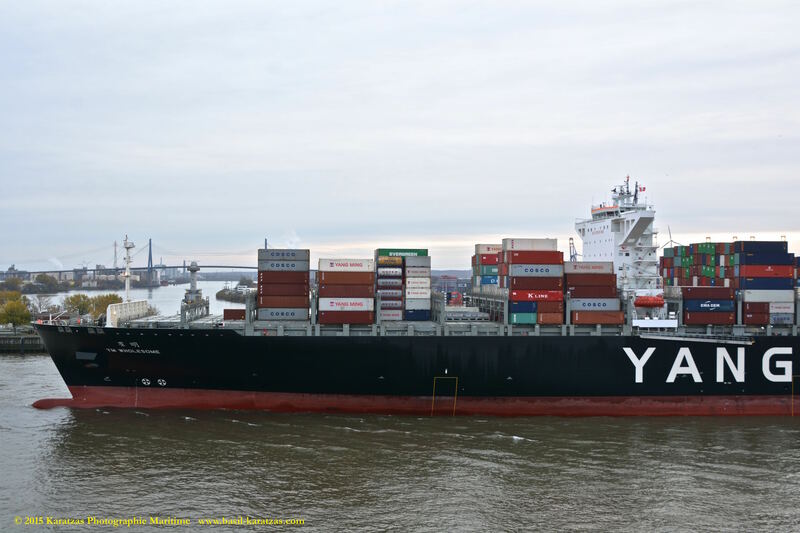 VESSEL IDENTIFICATION & DETAILS: Call Sign VROO4, IMO Number 9704611. 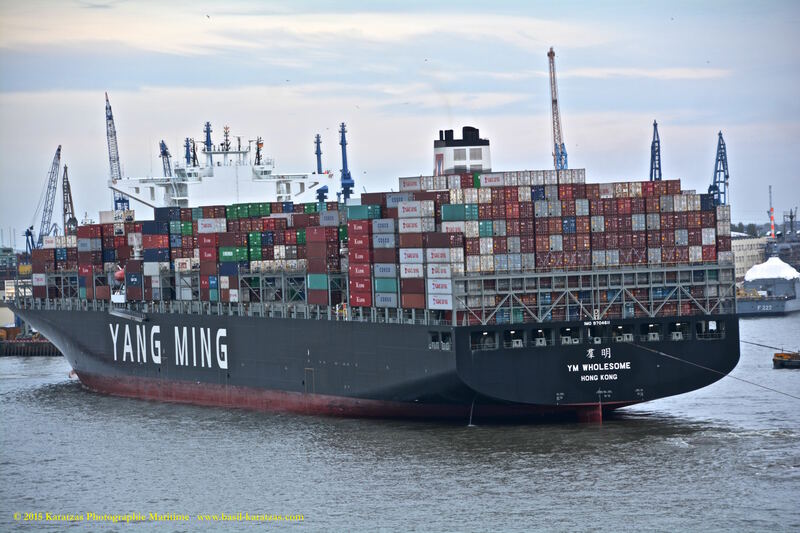 Built at Hyundai HI, Hong Kong Flagged, LR Classed, Length Overall of 368.00 m., Moulded Depth of 30.00 m., Draught of 16.00 m., Beam of 51.00 m., Gross Tonnage of 144,650. 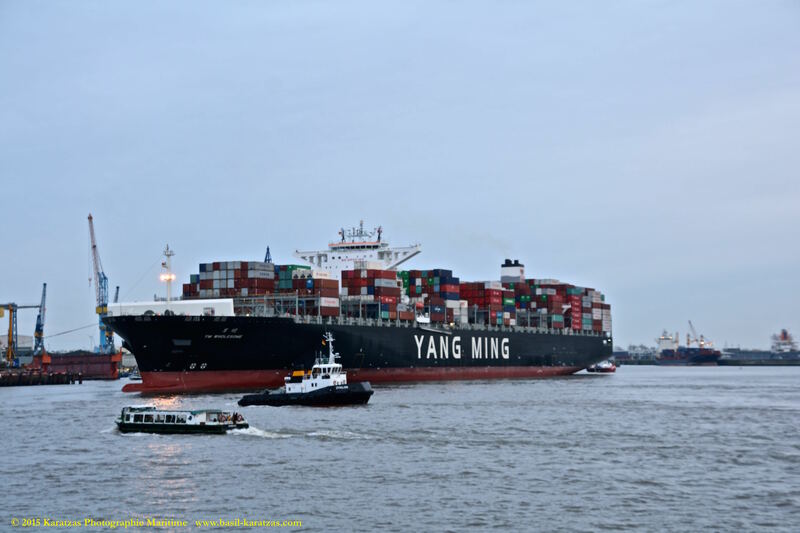 ENGINE DETAILS: 2 S.A. 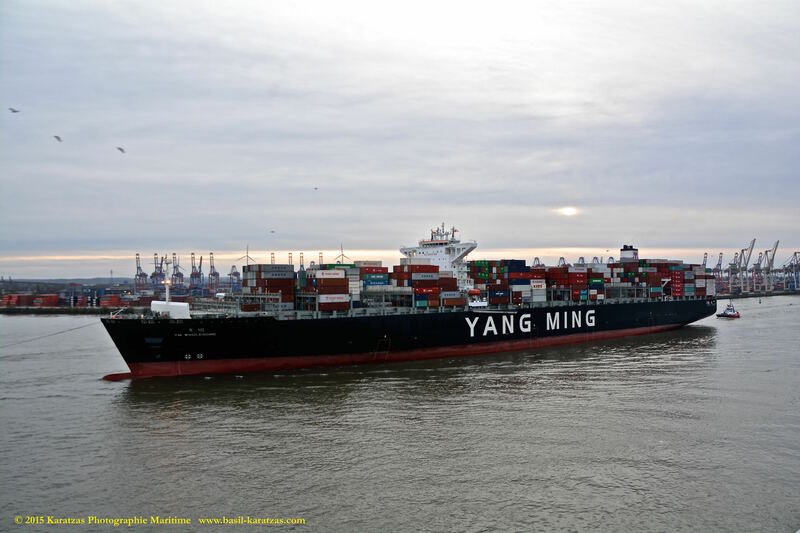 11-cyl., Engine Model 11S90ME-C9.2 MAN B. 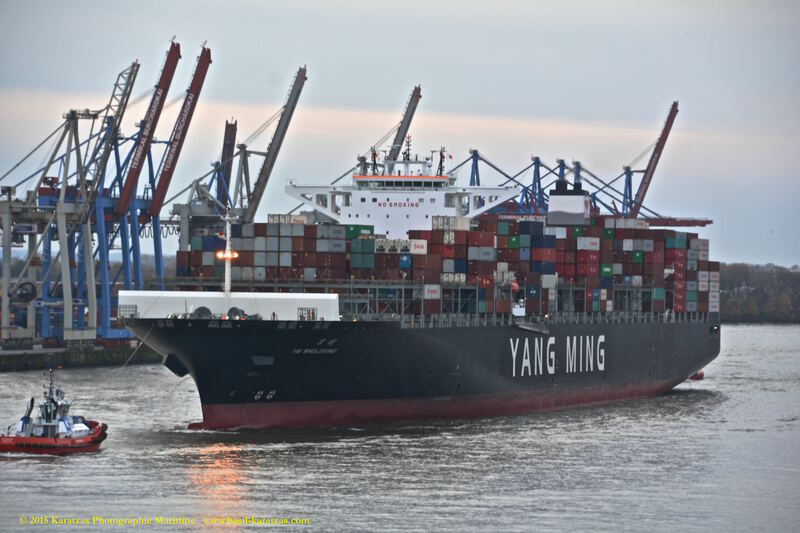 & W. Engine, Speed of 23.20 kts, Heavy Fuel Oil, Horsepower of 73858. 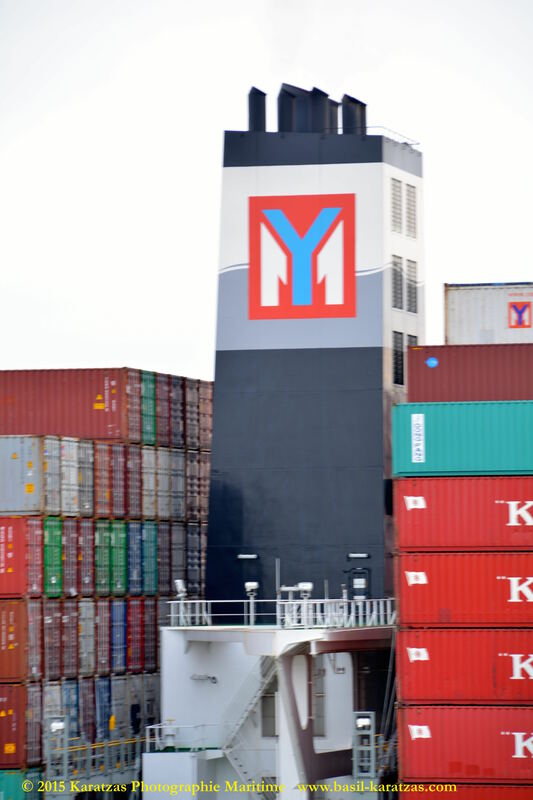 Design Seaspan SAVER (HHI 14000TEU) by SeaSpan. 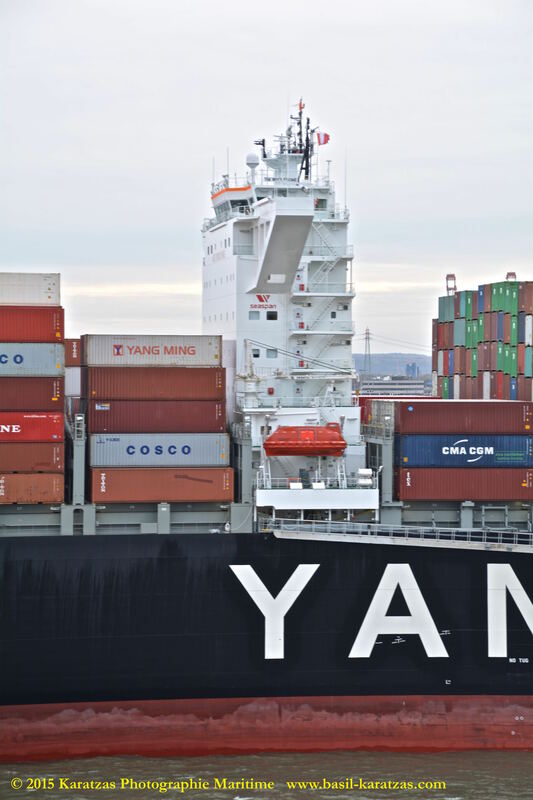 VESSEL OWNER / MANAGER DETAILS: Seaspan Corporation; company website: http://www.seaspancorp.com. 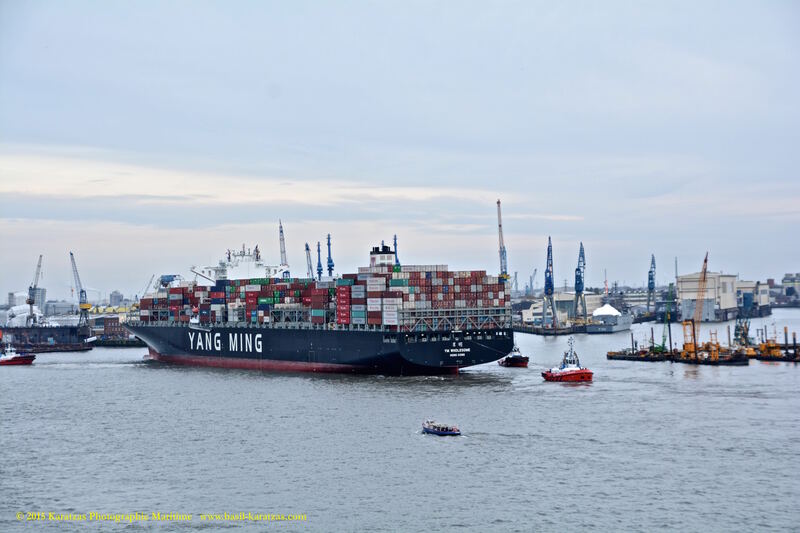 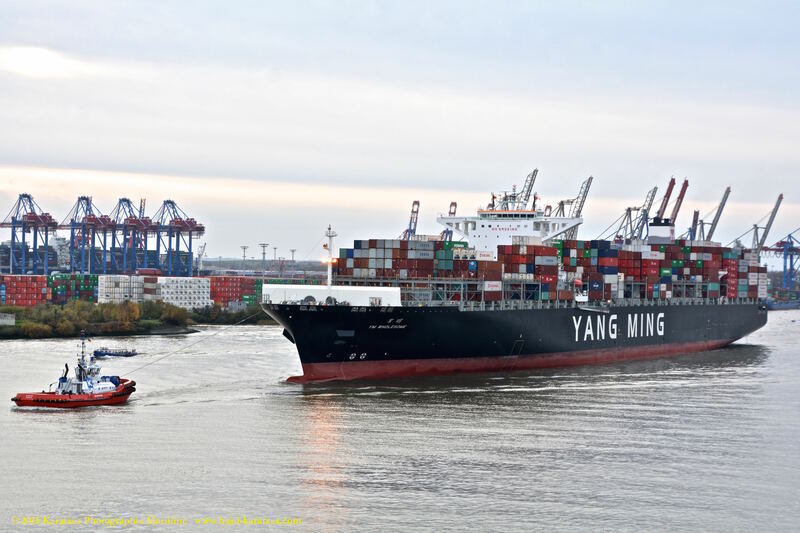 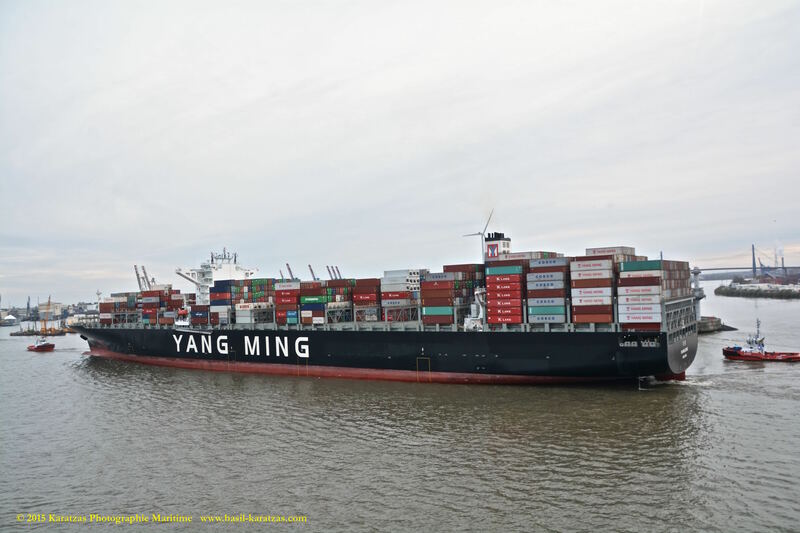 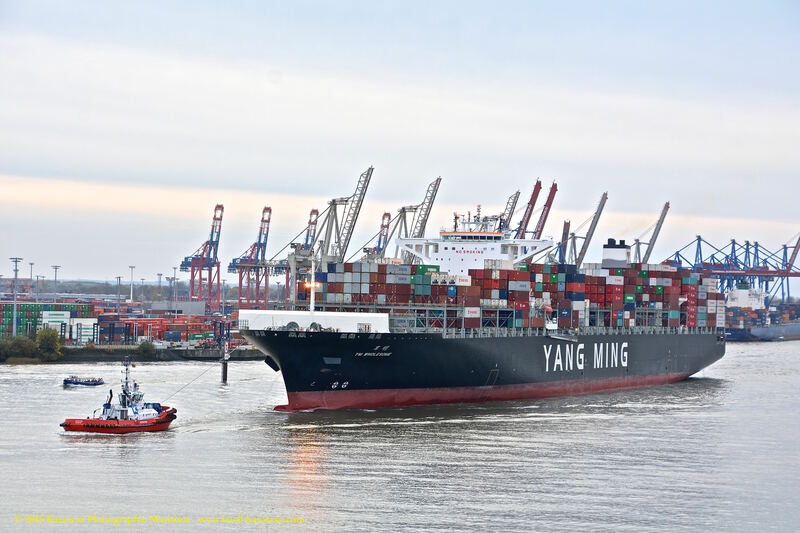 The vessel’s typical itinerary is Xingng, Dalian, Qingdao, Shanghai, Ningbo, Singapore, via Suez Canal to Felixstowe, Rotterdam, Hamburg, Antwerp on the NE3 string Asia / North Europe Weekly Express Service 3 in the CKYHE Alliance (Cosco, “K” Line, Yang Ming, Hanjin, Evergreen). 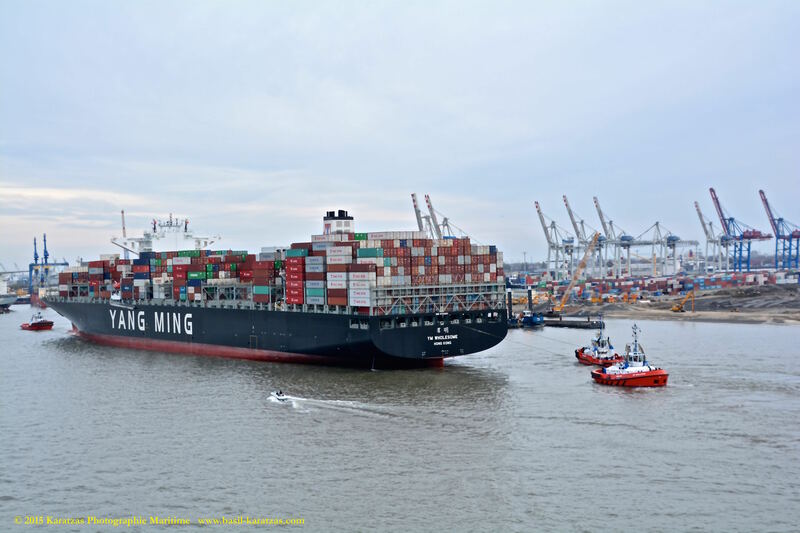 One has to admire the efficiency of the supply chain: in this string of pictures, MV ‘Wholesome’ is docking within an hour of the un-mooring MV ‘Cosco Faith’, minimizing the downtime at the dock. 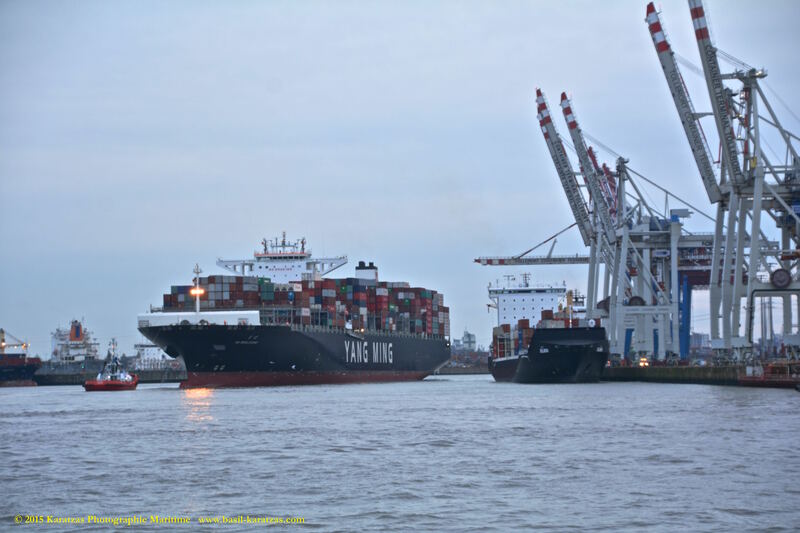 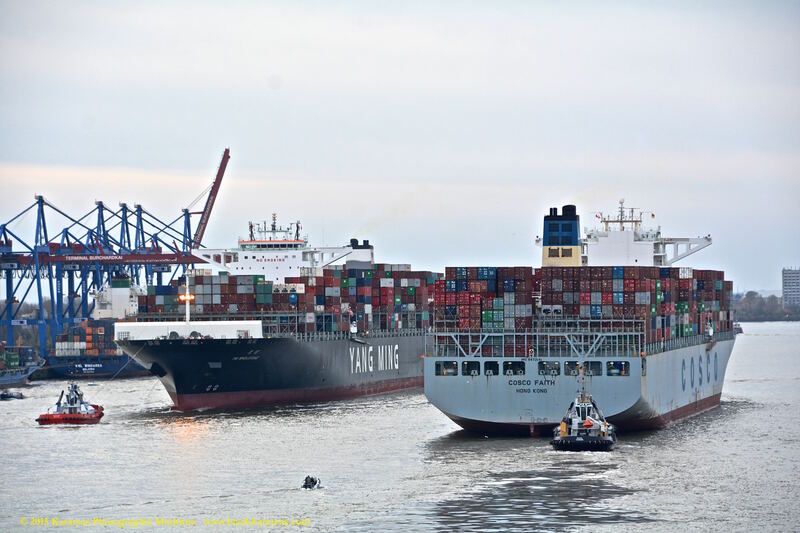 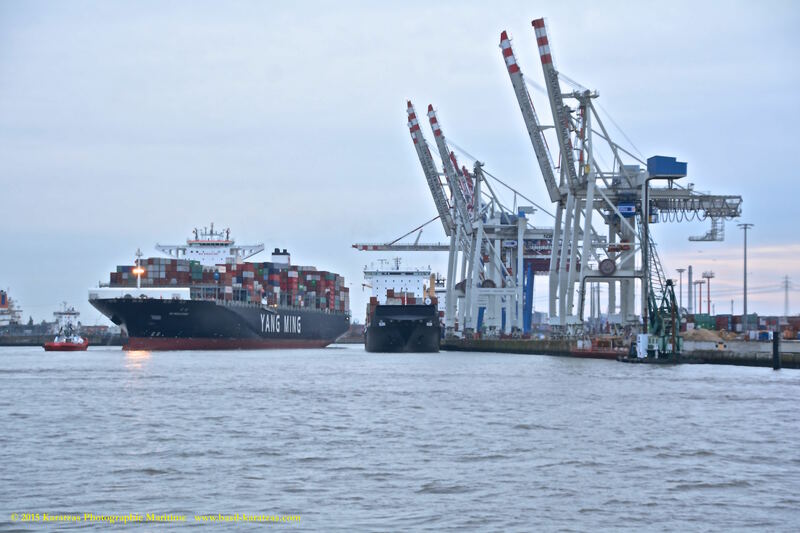 The two vessels cross paths at the closest point to the dock where both these huge ships could safely be next to each other in the navigational channel of the Elbe River in the Port of Hamburg. 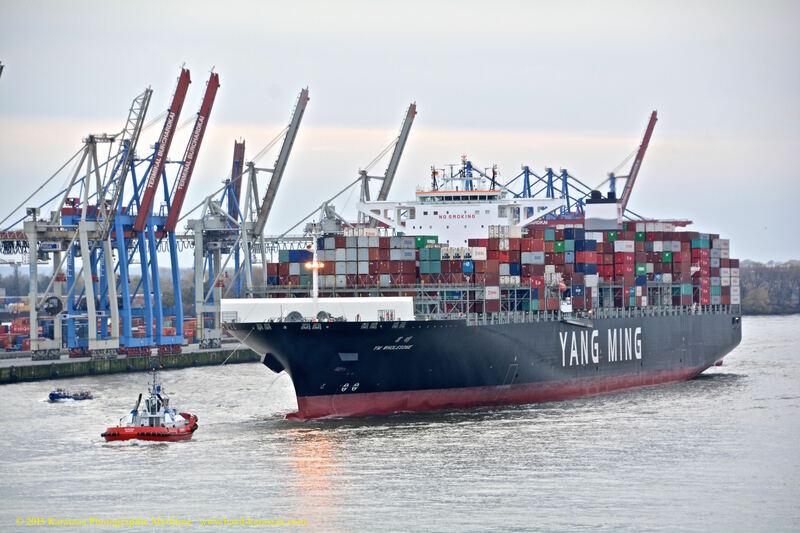 CARGO HANDLING DETAILS: Teu Capacity of 14,100 Total, 9,527 Homogeneous and 2,000 Reefer.